For a final picture from the top (or in this case, the 4th floor) of the Embassy Suites Hotel, I want to show you Mt. Baldy to the northeast. 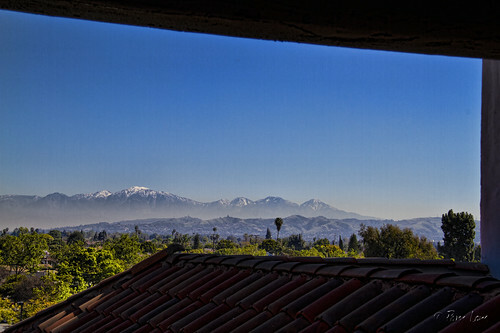 At 10,068 feet (3,069 meters), it is the highest point in Los Angeles and the tallest peak in the San Gabriel Mountains. Until our hot spell last week, Mt. Baldy (or Mount San Antonio, as it's really called) was thoroughly covered with snow. Now, you can see the mountain starting to show through. Still, we'll continue to see snow there for another month or so. There's a family-owned ski resort up there. At about an hour and a half away, it's our closest ski resort. The next closest (and more popular) ski area is another hour to the east.